^ Krapu, Gary L.; Reinecke, Kenneth J. (1992). "Foraging ecology and nutrition". In Batt, Bruce D.J. ; Afton, Alan D.; Anderson, Michael G.; Ankney, C. Davison; Johnson, Douglas H.; Kadlec, John A.; Krapu, Gary L. (eds.). Ecology and Management of Breeding Waterfowl. University of Minnesota Press. pp. 1–30 (10). ISBN 978-0-8166-2001-2. ^ Abraham, Richard L. (1 October 1974). 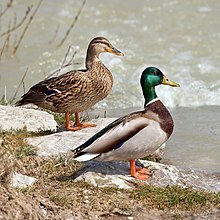 "Vocalizations of the Mallard (Anas Platyrhynchos)" (PDF). The Condor: Ornithological Applications. 76 (4): 401–420. doi:10.2307/1365814. Retrieved 15 February 2019. ^ a b Drilling, Nancy; Titman, Roger; McKinney, Frank (2002). Poole, A. (ed.). 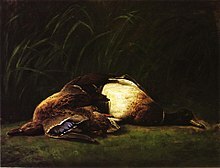 "Mallard (Anas platyrhynchos)". The Birds of North America Online. doi:10.2173/bna.658. Archived from the original on 21 June 2016. Retrieved 1 February 2011. ^ a b c Uyehara, Kimberly; Engilis, Andrew; Reynolds, Michelle. Hendley, James (ed.). 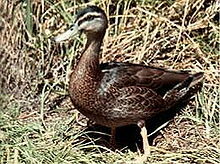 "Hawaiian Duck's Future Threatened by Feral Mallards" (PDF). Archived from the original (PDF) on 4 May 2017. Retrieved 19 June 2017. ^ Griffin, C.R. ; Shallenberger, F.J.; Fefer, S.I. (1989). "Hawaii's endangered waterbirds: a resource management challenge". In Sharitz, R.R. ; Gibbons, I.W. (eds.). Proceedings of Freshwater Wetlands and Wildlife Symposium. Savannah River Ecology Lab. pp. 155–169.